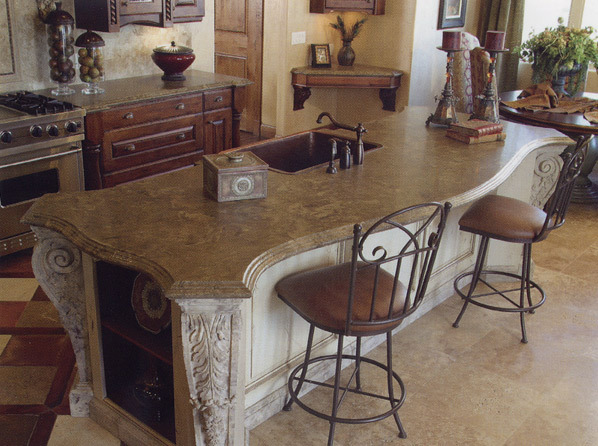 There are many different styles of engineered stone countertops that can be chosen for placement in your home. The countertop can be selected to match a home's existing décor or chosen because of its appeal to the homeowner, who will decorate the rest of the kitchen around the style of the countertop. The many options available to choose from in engineered stone countertops can make choosing the right countertop for your home a difficult decision, but with careful consideration and a little bit of time you should be able to find the perfect countertop for your needs. The biggest decision that will need to be made is what color of engineered stone countertop to choose for the home. These stone countertops come in a wide variety of different colors, including brown, gray, black, pink, red, green, and blue, and each of these colors can come in a number of different shades or color combinations. If the homeowner is attempting to find a countertop that complements their existing décor, it is important that they do not base their decision off of looking at a small sample of the countertop material because the overall pattern may look very different once it has been installed in the home. The next option that the homeowner will have to decide is whether to purchase a countertop made out of engineered stone slabs or tiles made from the engineered stone. The slabs will be heavier and stronger, but they will also be more expensive and can be difficult to repair or replace if it becomes damaged. Countertops made out of engineered stone tiles will have all of the desirable properties of the stone slabs, but the layer of stone is much thinner and has a higher chance of breaking. It is easier to repair a countertop made out of stone tiles because the damaged tile can be removed and replaced with a new tile. The edging of the engineered stone countertop is another option that must be considered when choosing a countertop for your home. There are several different styles of edging that are commonly used for engineered stone countertops and sometimes several different styles can be combined to create a unique style that is attractive to the homeowner. Manufacturers that create and install engineered stone countertops will often have a catalogue of the different edging styles that are available for their products and they will be able to answer any questions that the homeowner may have about the edging styles. Other details that will need to be considered are the decorative touches that can be used to enhance the appearance of the engineered stone countertop and the style of the backsplash attached to the back of the countertop. By carefully weighing each of these options and imagining what the finished product would look like in the home, the homeowner will be able to purchase the perfect engineered stone countertop for their home.